Consoles don’t get nearly as many business management simulators as the PC market does, so when one comes to the console market it generally has to be something interesting to catch the eye of anyone who isn’t into the genre. Frontier Developments likely knows this as well as anyone, as their work on the Thrillville series on the consoles and Roller Coaster Tycoon games on the PC implies. Zoo Tycoon is one of their first real attempts at an actual business simulation game in a few years (along with Coaster Crazy Deluxe on Wii U), as they’ve been busy, between the LostWinds series on the Wii and the Kinectimals series on the Xbox 360. 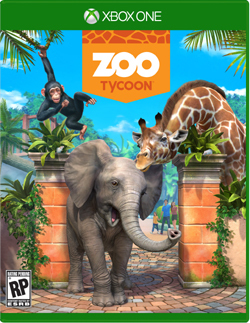 They actually seem to have taken some lessons from the latter game into their development of Zoo Tycoon, as it offers a lot of kid-friendly animal interaction to offset its zoo management aspects, making it a game that has a wide appeal to younger gamers at the very least. 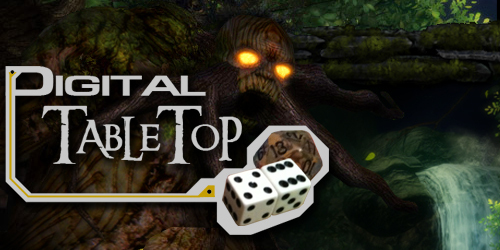 The downside of this is that the game simplifies its management aspects to compensate for this, and while it’s not a simple business simulation game, it may not be the complex management simulation genre fans might have been hoping for. Zoo Tycoon is probably one of the better choices to make if you’re looking to pick up a game that shows off the visual capability of the Xbox One, due in large part to the sheer personality of the visuals. The zoo elements you can build are interesting looking, to be sure, and whether you’re on the ground or up high lording over your zoo, you can pretty easily figure out what everything is without too much effort. The game also allows you to get as up close and personal or distant as you need to be to your zoo, and while the various facilities aren’t instantly identifiable at first glance, they do all look obviously different at any range, so sorting them out isn’t hard. 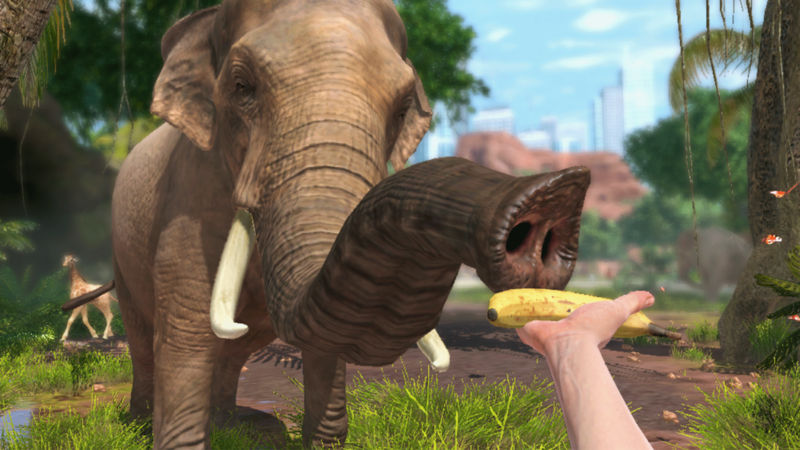 The best parts of the game’s visuals, though, come from seeing the animals up close. To put it simply, interacting with your animals through the various interactive options in your park is fantastic, and not only shows what the Xbox One is capable of, but will likely entertain kids (and possibly adults) for hours. Aurally, the music is perky and has a cheery feel to it that fits the theme of the game, and while it’s nothing you’ll want to listen to outside of the game, it’s cute and effective while you’re playing. 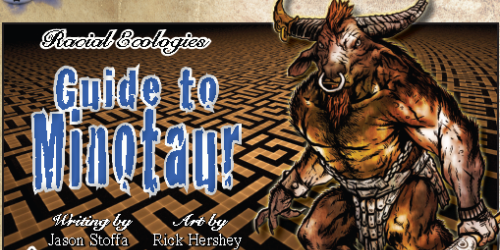 The sound effects are generally top-notch, be it the ambient noises coming from your zoo, the special effects that pop up when you build and upgrade, or the animal noises when you’re feeding or hosing down an animal, and they make the experience come alive very nicely. 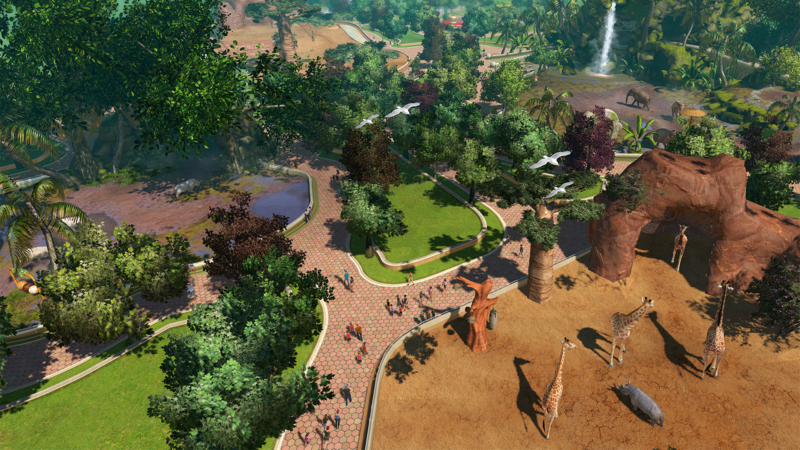 The majority of Zoo Tycoon is spent managing your zoo, whether you’re taking on a brand new one or jumping into an existing campaign. You can either do so from ground level, running about the zoo as your groundskeeper and looking at everything up close, or from overhead, taking in the view of the entire zoo for optimal efficiency. The menus are generally easy enough to navigate, and you can aim the cursor or your point of view at the specific thing you want to interact with at the time and press A to open up its menu, or move over empty space to build an entirely new thing in the park as you see fit. Most of the time you’ll be looking at things from overhead, as it makes building the zoo much easier, as you’ll have a better idea of what you have and where you’ll want to place things. Once you have the park laid out as you see fit, however, you can drop down to ground level and run about, interacting with the exhibits, driving a cart around to places and so on, taking in the zoo as you’ve designed it instead of just looking into it from a bird’s eye view exclusively. When you’re designing the zoo, you’ll have various different options of things to build, depending on what your zoo needs at the time. The big things are exhibits, obviously, as these are where you place your animals so that people can see them. You’ll be able to choose different size exhibits, however, depending on how many animals you want to host at one time; smaller exhibits are good for single groups of animals, while larger exhibits allow for more space to accommodate several species at once for a more interesting and space-friendly exhibit. Each exhibit also allows for additions, such as food dispensers, cleaning devices, toys and interactive displays so visitors (and you) can play with the animals. You can also build mini-exhibits for smaller animals to be showcased, food and entertainment concessions to keep visitors happy and keep money coming in, decorations to make the park look livelier and facilities to keep the park running smoothly. 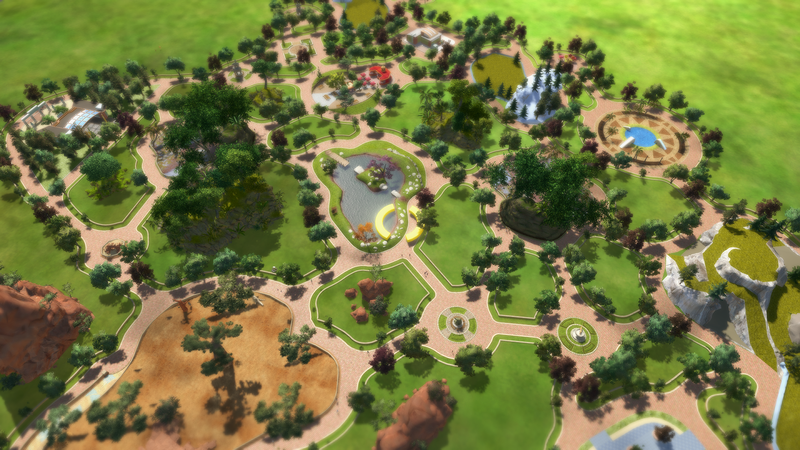 The majority of your park additions also allow for upgrading (up to three levels), which improve their overall functionality and appeal. Upgrading can also confer additional bonuses for many things; for food dispensers this improves the amount of food they can hold at once, for facilities this adds another slot for hiring employees, and so on, so upgrading, though expensive, is often well worth it. As you add to your zoo or upgrade things, you’ll see a star at the top of the screen fill up, which indicates the general popularity of your zoo. When it fills up, you’re given a pop-up that indicates you’ve increased your zoo’s popularity to its next level, and can unlock new bonuses to play with. Each level generally unlocks new upgrades for your zoo, as well as new animals to adopt, making it worthwhile to put your effort into upgrading your zoo as much as possible. Now, adding on basic amenities and such is an important part of upgrading, but you’ll generally need to balance this with the needs of your guests and the need for money. Money is made, obviously, by bringing in more guests, which can be done by making a pleasant zoo, as well as by advertising your presence out into the world. As your guests visit, they’ll generally indicate what their experience was, which you can see by pressing the left trigger when you’re not targeting anything in the zoo. This will inform you of what they’re happy about (in green) and what could be better (in yellow or red), as well as what your animals think of the zoo. Addressing anything that isn’t top tier is a big part of the zookeeping experience, as you’ll, say, need to add or upgrade restrooms or hire more janitors if your appropriate scores are low, or tend to animal needs if they’re not happy, for example. Doing so keeps the visitors coming, which keeps money rolling in, which keeps your zoo constantly flush with new equipment and animals, which is basically the major point of the game overall. When you start up the game, you’re given two options for how you want to play: Single, or Co-op with up to three friends online. Single player mode offers an exclusive Training mode that teaches you the fundamentals of how to run your zoo, which is likely where you’ll want to start your experience. There are three other modes of play you can jump into across both modes once you understand the basics: Freeform, which lets you build a zoo with no financial concerns to worry about, Challenge, which lets you run a zoo normally and offers you basic challenges as you play to earn more cash, and Campaign, which tasks you to take on twenty challenges at Easy, Normal or Hard difficulties to test your skills. Playing in Challenge and Campaign unlocks new toys to use throughout the rest of the game, so you’ll certainly want to spend time in those modes, as without completing Campaign you’re limited in what locations you can choose for your zoo in Freeform, and playing Challenge mode unlocks new animals for your Freeform excursions. Campaign mode tends to present players with set, specific challenges up front, almost entirely revolving around proper zoo management, while Challenge mode gives you random challenges every so often, which can revolve around zoo and animal management, or around racing through the zoo or playing with the animals, making it more varied in design. You don’t need to play these modes, however, so young kids can absolutely just jump right into Freeform, make a zoo, and run around playing with the animals if they’re so inclined, while their parents can go back later and unlock the content instead if they wish. There’s also a “Community” option that seems to allow players to vote on what the next challenges will be, though outside of casting a vote once every so often, it doesn’t seem to do anything special. You can generally get through the Campaign in around ten to fifteen hours, and max out a Challenge map to unlock everything for Freeform in another five to ten if you manage your resources right, but there’s still plenty to do even after that’s finished. You can play with your friends online, creating the best possible zoo with online buddies, or you can jump in and make zoos all across the world alone if you’re so inclined. Challenge mode allows you to make new zoos wherever you wish, so you can jump to a new location and get to work almost immediately whenever you like. Freeform, on the other hand, lets you goof off and make a zoo however you wish, so once you have everything unlocked you can just get to work without worrying about expenses or research and have fun making a zoo just the way you want it in no time. There are also a pretty wide variety of Achievements to unlock as you play, and challenges are available (as they are with most Xbox One games) to complete, so you’ll have plenty to do with the game for a good while in that respect. 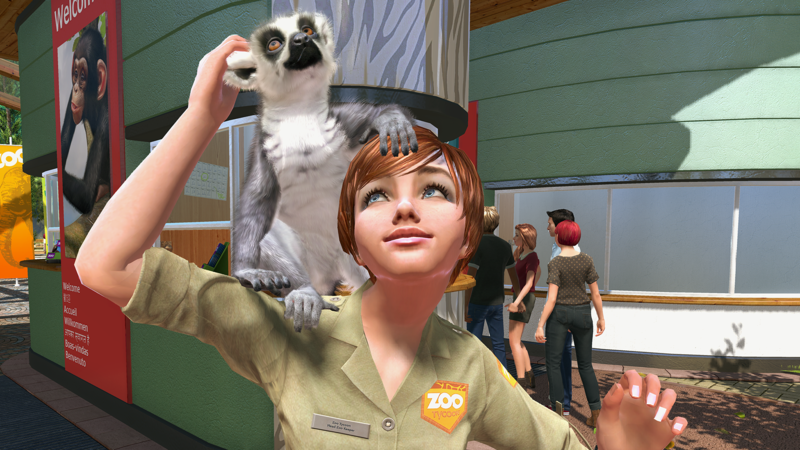 Additionally, the game does offer some fun for those who like the Kinect, as you can use the interactive elements of zoo exhibits with the Kinect to play with, feed and wash animals, and you can shout out what you need at the time instead of using the controller for many interactions, which works out pretty well. As such, the game is generally full of content, easy to play, and structured in a way that kids and adults can goof around with it as they wish and have fun. Honestly, though, Zoo Tycoon manages to stay entertaining for a long while due in large part to its personality and aesthetics, and while it tries to do too much and focuses on too little, what it does mostly works well enough to keep it interesting to kids and adults for a good while. The game is one of the more visually impressive launch titles for either of the two big next gen consoles at this point, and it sounds thematically appropriate and interesting all in all. The gameplay works very well, whether you’re lording over your zoo from above and building it in your own image or walking around checking out the exhibits with the guests, and between the in-depth tutorials and easily navigated menus, you should find the game easy to learn and work with. There’s also plenty to do with the game, as you can play alone or with online friends to either complete the campaign, build a zoo from nothing and complete challenges along the way, or just have fun in a no-challenge zoo building session, and there’s a decent amount of extra content to bring you back for more no matter what your interest is. That said, the game tries to do too much at one time, leaving the simulation aspects unchallenging for diehard fans and the animal interaction limited overall, there’s little overall variety unless you’re a serious animal lover, and the inability to turn off Kinect functionality makes the game freak out if you don’t actually want to use it. With some added content and an option to turn off the Kinect features, Zoo Tycoon would be an easy slam dunk for the Xbox One, but what’s here is still worth checking out for animal lovers and younger gamers, though it may be too limited for everyone to enjoy. Zoo Tycoon is one of the more visually appealing launch titles for the Xbox One, and younger gamers and animal lovers should certainly find it to be worth their time, though it lacks in some areas that make it harder to appeal to everyone. The game looks excellent on the Xbox One and has a lot of visual personality, the audio is generally fitting in all respects, and the gameplay is easy enough to work with and comes with an extensive tutorial to show you how things work. You can play alone or with online friends to complete the Campaign challenges, build your own zoo and take on random challenges over time, or just build the zoo of your dreams with no restrictions, and between the simulation and animal interaction elements, unlockable content and Achievements, you’ll find there’s plenty to bring you back for more. 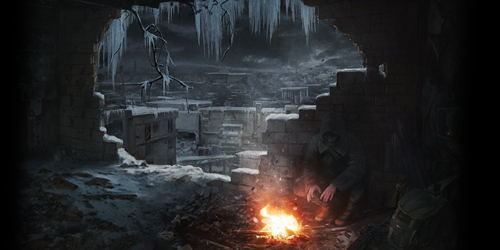 However, the game does too much without focusing on anything, leaving the simulation aspects too easy for genre fans, the animal interactions too limited overall, and the overall experience too shallow, and the inability to turn off the Kinect functionality makes the game a hassle when you don’t want to use it. Still, Zoo Tycoon should still be a fun time for younger gamers or those who’ve always wanted to run their own zoo, and while it might be a bit too limited for genre fans, it’s charming and fun enough that it’s worth a look if nothing else.